Internationally renowned traditional group, Altan, will be appearing in concert in the Strule Arts Centre, Omagh on Thursday 13 December at 7:30pm. The Donegal-based band has long enjoyed a reputation as one of the foremost and innovative traditional bands to come out of Ireland. Their music traverses the range of traditional music, from sensitive and touching ancient ballads to the energetic foot-tapping reels and jigs steeped in the rich and colourful heritage of founding member Mairéad Ní Mhaonaigh’s native County Donegal. After more than 30 years of touring worldwide and a hugely impressive back catalogue of exquisitely produced award-winning recordings, Altan remain one of Ireland’s most sought-after live acts. 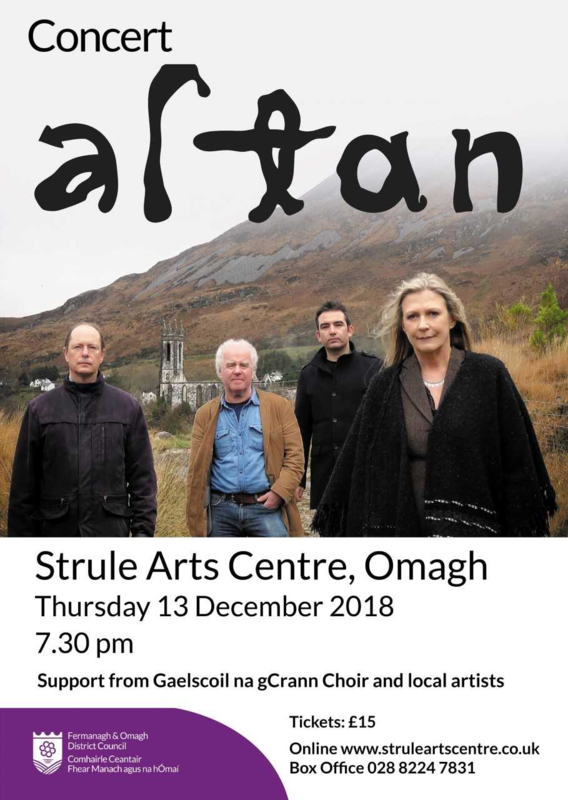 For their performance in Strule Arts Centre, Altan will be supported by the choir of Gaelscoil na gCrann and other local artists. Tickets for the concert are £15, and can be purchased online at www.struleartscentre.co.uk or from Strule Arts Centre box office (028 82247831). For more information on this event, please contact Fermanagh and Omagh District Council’s Irish Language Development Officer, Kevin Goodwin on 0300 303 1777 or by email at kevin.goodwin@fermanaghomagh.com. 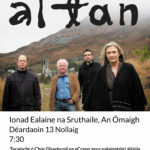 Beidh an sárghrúpa ceoil Altan ag seinm i gceoilchoirm a bheas ar siúl in Ionad Ealaíne na Sruthaile, An Ómaigh Déardaoin 13 Nollaig ar 7:30 i.n. Tá clú agus cáil ar Altan ar fud an domhain le fada an lá mar an bhuíon cheoil traidisiúnta is fearr in Éirinn. Tá réimse ceoil bríomhar acu a bhfuil sean-bhailéid corraitheacha agus stór leathan de cheol fuinniúil Thír Chonaill (áit dúchais bhunaitheoir an ghrúpa Mairéad Ní Mhaonaigh) mar pháirt de. I ndiaidh dóibh tríocha bliain a chaitheamh ag cur a gcuid ceoil ar ardán agus inar ndearna siad an iliomad taifid a bhfuil go leor duaiseanna buaite acu, tá Altan go fóill mar cheann de na grúpaí ceoil is mó tóir orthu in Éirinn. Cór Ghaelscoil na gcrann agus ealaíontóirí áitiúla a bheas le cloisteáil mar thacaíocht ag Altan ag tús na ceolchoirme seo in Ionad Ealaíne na Sruthaile. Is féidir ticéid don cheolchoirm a cheannach ar £15 ó Ionad Ealaíne na Sruthaile ach glaoch a chur ar an uimhir 028 82247831 nó ar líne ag www.struleartscentre.co.uk. Le tuilleadh eolais a fháil ar an imeacht seo téigh i dteagmháil le Oifigeach na Gaeilge Chomhairle Fhear Manach agus na hÓmaí Caoimhín Goodwin ag an uimhir chéanna nó ar r-phost ag kevin.goodwin@fermanaghomagh.com.